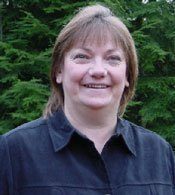 THE DOCTORS HAD TOLD HER THERE WAS NOTHING THEY COULD DO TO RESOLVE HER NEARLY CONSTANT HIP PAIN. They had explained to her why she’d have to learn to live with it and how, over time, it would only get worse. I was nervous when I sat down to work with her, but it’s not my job to decide what’s possible. It’s not even my job to heal people. It’s my job to help my clients get in touch with their own “inner healer” and help activate the healing power we all have inside. I began to use the techniques I’d learned over the years. In particular, I began to think about a set of techniques I’d learned from Michael Bennett. I’ve seen Michael perform what would look like miracles to an uninformed outsider. But I know Michael is skillfully applying a barrage of NLP and hypnotic techniques in order to get powerful results. I used the techniques Michael taught me and an hour and a half later–no pain! I began to wonder how I could help bring this wisdom to others. So, here's what I did . . . I videotaped a powerful healing session Michael did with a gal who had been suffering for 10 years with migraines and neck pain, due to an automobile accident. After the session–no pain, no migraines! I took the raw video and added paint-by-the-numbers explanations and filled out the theory so you could more fully understand and implement the techniques. I included Michael’s extensive question and answer session at the end of the video–get the benefits being there live and being able to get your questions answered. I did an extensive interview with Michael, going over all the techniques he used, his philosophies and belief systems about healing and his approaches so you can get the same results he does. I wrote out the procedures and developed exercises that will take you by the hand a lead you through becoming a master with these powerful healing techniques. It’s 15 pages included in a notebook for easy access. The result is the Miraculous Healing with Neuro-Linguistic Hypnotherapy® program. Learn the Traumatic Injury Relief Pattern–modeled from a Peruvian shaman and integrated with the best techniques from NLP and hypnosis, the T.I.R.P can help you reduce or eliminate pain and symptoms from very real accidents, wrecks or other physical trauma. Discover how to use hypnotic language in the healing context so that your language multiplies the effectiveness of your work. Learn about three-dimensional thought fields and why they may be critical to your client’s healing process. Ignore them and all your hard work may go down the drain. Discover how to dissolve belief systems that are getting in the way of healing by using simple, yet almost magical language patterns. Learn what “Representational Energy Healing” is and how this “energy work” process can obliterate symptoms that have been hanging on for years. Absorb techniques showing you how to communicate with empowering and healing messages that go straight into the unconscious mind. 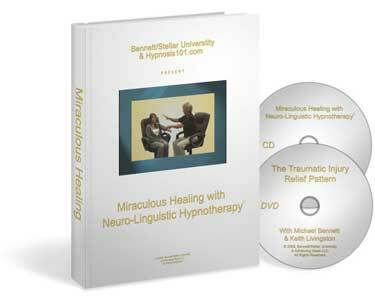 If you have clients that have pain, and have not found any relief, then I highly recommend the CD & DVD, “Miraculous Healing with Neuro-Linguistic Hypnotherapy®”so that you can free them from their pain and help them reclaim their lives. To help as many people as possible, click on the order button below. I’ve priced it so anyone who’s serious about helping people can afford it. 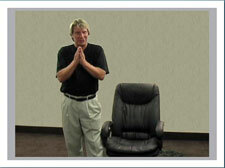 GET MIRACULOUS HEALING WITH NEURO-LINGUISTIC HYPNOTHERAPY®, NOW, AND. . .
WATCH NLP MASTER MICHAEL BENNETT, USE 3-DIMENSIONAL THOUGHT-FIELDS AND DOZENS OF OTHER TECHNIQUES, TO RELIEVE A CLIENT OF A TEN-YEAR PROBLEM. THEN LISTEN AS EACH TECHNIQUE IS FULLY EXPLORED AND EXPLAINED. Online Course: Same content, instant & lifetime access, no shipping cost, environmentally friendly. Shipped to your door: One DVD, one audio CD and one workbook, for a comprehensive program.